Two years ago, Russ basically cut out all carbs, and I trailed along. Since then, one go-to dinner side at our house is roasted veggies. 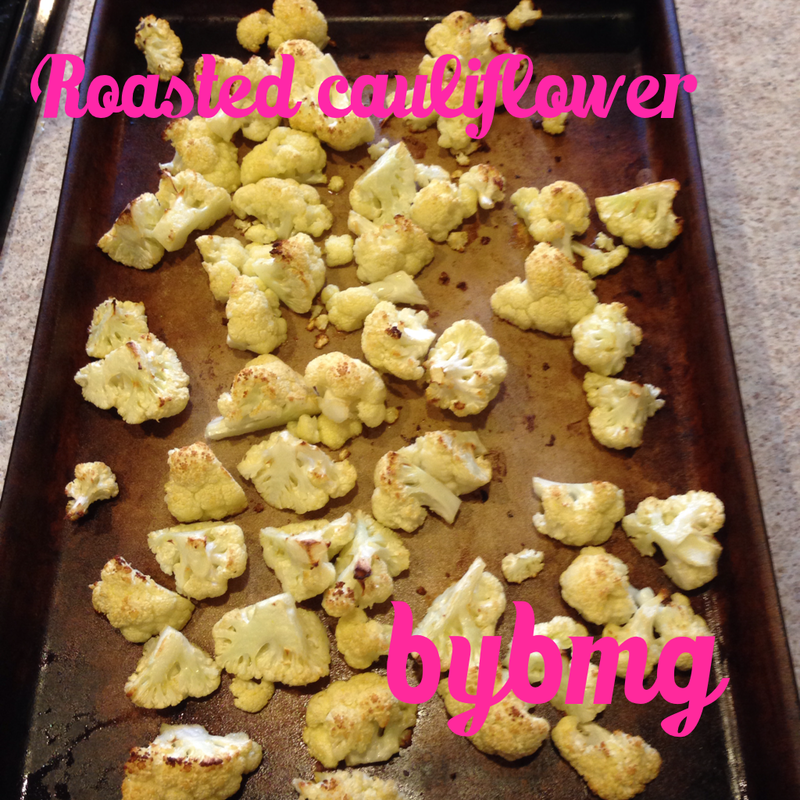 We do a lot of sweet potatoes and potatoes, but cauliflower has been a favorite for a while. Now, I do have a mini-horror story about cauliflower. Basically until about two years ago, I refused to eat it. When I was a little kid we went to an Easter celebration where there was a little relay race and the participants had to chow down fresh veggies. I got the cauliflower, and it made me sick. Literally. I swore off cauliflower all together for years, but finally can eat it again, only if it's cooked. We do cauliflower crust pizza, cauliflower rice, and roasted cauliflower like I'm going to show you today. 1. Get a nice head of cauliflower, or if you want to be quick, grab the bag of pre-cut cauliflower from the produce section. If you do that, skip right down to step 5. 2. Take off the leaves, and give it a rinse. 3. Cut our the core/stem. 4. Chop it up. Some will end up in pretty florets like these, and others will just be chunks. 5. Put it in a bowl, drizzle on olive oil, and add some of your favorite seasonings. We usually use salt and Cavender's seasoning. 6. Put on the lid and shake it up to coat the cauliflower evenly. 7. Put it on a baking pan - I LOVE my Pampered Chef stoneware. 8. Bake at 425* for about 25-30 minutes (depending on how roasted you want it). Then it's done! Enjoy! Today is the last day to enter my giveaway for an imperfectly beautiful Toms bag!